A restaurant’s application to have its sidewalk café permit renewed was rejected by Community Board 1 on Tuesday. 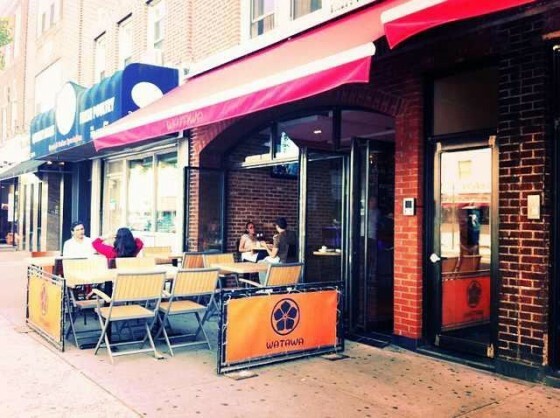 Watawa Sushi, located at 33-10 Ditmars Blvd, was one of five local businesses that applied to renew its sidewalk café license but was the only one rejected. The restaurant, which currently has a sidewalk café consisting of 10 tables and 26 seats, failed to send a representative to the meeting to advocate on its behalf. Nevertheless, the board did not raise any questions as to its application. The application looked as though it was going to be approved without issue– particularly after CB1’s Consumer Affairs Committee, which is specifically tasked with reviewing licenses, recommended that the full board approve it. The full board appeared to agree with the committee’s recommendation, as all 31 board members in attendance raised their hand in approval. However, Community Board 1 Chairman Vinicio Donato then objected and said he wanted to vote against it. “I want him to know that at least one person voted no,” he added. One board member then said she wanted to change her vote, which led to laughs from many board members. A second vote was then taken, with all the board members in attendance voting against this application. Laughs once again filled the room. The community board’s vote, however, is advisory and it is ultimately up to the Department of Consumer Affairs to make the final decision. However, the board’s vote does carry some weight. Dominic Stiller, the owner of a gastro pub in Dutch Kills, thought CB1’s decision was questionable. There were four other bars/restaurants that were applying for the renewal of their outdoor café space. They had representatives at the meeting. Please Note: A representative of the restaurant met with Donato after the meeting and it was changed to approved. Pretty dumb reason but would prefer that Watawa didn’t have or have as much outdoor seating. There is hardly any room to walk on the sidewalk. Can we please elect and term limit Community Board members? Donato changed a few votes with his comments about kissing his ring, but the entire board did not vote no on the “second” vote. The renewal still had the votes to be approved. If it wasn’t, the record of the vote is inaccurate, like this article. The article is 100% correct. The entire board did vote “no” after CB1 Chair’s comments. However, after the meeting, the CB1 chairman spoke to a representative of the restaurant and it was approved later, accord to CB2 manager Monday. What a bunch of petty, infantile clowns. That is disgusting – they have no good reason for denying their support of the license and behaved like petulant losers. Donato, huh? I’d like to know who the line tower that changed their vote. That’s a real clown.